There are two compelling reasons to see the Arena Stage production of Long Day’s Journey Into Night. The first is the outstanding direction of Robin Phillips, former Artistic Director of the Stratford Festival, who brings more out of O’Neill’s text than I’ve seen in any previous production. The second is the absolutely magnificent performance of Helen Carey as Mary Tyrone. Under Phillips’ direction, she gives the most finely detailed reading of what is perhaps O’Neill’s greatest character. Carey’s performance is of such an impossibly high calibre that if the others actors don’t reach her level it is quite understandable. Phillips first directed Long Day’s Journey at the Grand Theatre in London, Ontario, and later remounted that production at Stratford in 1980 with William Hutt as James Tyrone and Jessica Tandy as Mary. He directed it again in 2000 at the Lyric Theatre in London, England, with Charles Dance as Tyrone and Jessica Lange as Mary. Phillips’ long experience with the play and his famous attention to detail made Molly Smith, Artistic Director of Arena Stage, seek him out to direct this production which is the centrepiece of the Eugene O’Neill Festival in Washington from March 9 to May 6 this year. Phillips’ view of the play is completely different from his own view of it in 1980 and from that of Diana Leblanc, who directed both the famous 1994 Stratford production (revived in 1995) and a production this year for Soulpepper. Most directors, like the early Phillips or Leblanc, present the action as the gradual revelation of the full extent of James Tyrone’s unconsciously noxious influence on his family with Mary’s addiction to morphine as the ultimate symbol of her victimhood. For those who have only seen the play in that light, Phillips’ production, carefully based on the text, will be a real eye-opener. First of all, Phillips does not make the play a revelation to the audience of Tyrone’s stinginess and Mary’s affliction but rather a devastating revelation to the family that the notion they are a family is a sentimental illusion. They are merely a collection of unfortunate individuals linked by blood, each of whom has put his or her own interests above those of the group and is all too ready to blame the others for his or her own failings. Mary’s addiction to morphine becomes the ultimate symbol of this. Her physical addiction may have begun because of Tyrone’s stinginess, but her mental addiction is fuelled by her desire to be rid of the husband and the sons who have burdened her life. As Edmund says, “You know something in her does it deliberately – to get beyond our reach, to be rid of us, to forget we're alive! It's as if, in spite of loving us, she hated us”. Mary struggles with such unwifely, unmotherly thoughts, but that, in the end, is the terrible truth that comes to light. Phillips depicts this physically in the play’s final tableau with Tyrone, Jamie and Edmund struck dumb in the darkness on stage right with Mary in a glow of light alone on stage left. Phillips’ approach changes the entire way we view the action. Normally, we see a cycle of increasingly unsuccessful attempts by the family members to hide the truth of various occurrences from each other. Mary must not know that Edmund has consumption and not just a “summer cold”. Mary must not know that the men suspect she has started taking morphine again. What Phillips makes so clear is that everyone in the family already knows the worst from the very beginning. The boys may think Mary has started again because of her moving about at night, but Tyrone knows the truth simply by looking in her eyes. They may think they can hide what they know, but Mary already knows they know. Mary may say that Edmund simply has a summer cold, but it’s clear that her fear that he has consumption, which caused her father’s death, has been the excuse to start again and thus to escape inwardly from difficulties she can’t handle. The play becomes a dissection of the futility of the family members in thinking any of their efforts can change what has already happened. Mary says, “None of us can help the things that life has done to us”, and that’s exactly what Phillips shows. All the harm each the Tyrones has done to the others has already been done. As Mary says, “The past is the present, isn't it? It's the future, too. We all try to lie out of that but life won't let us”. The action of the play is their progressive confrontation with what the past has made inevitable. 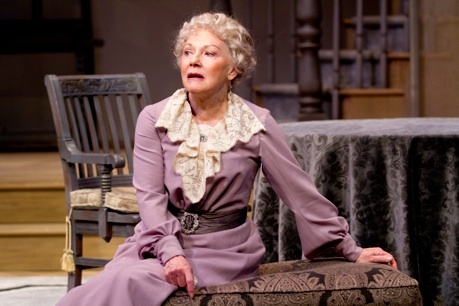 Helen Carey’s performance is outstanding on so many levels that she now displaces Martha Henry of Leblanc’s Stratford production as the best Mary Tyrone I have seen. Never before have I seen the progress of morphine’s effect portrayed in such scrupulous detail. Since Mary has started again the previous night, she is lively in the morning but also slightly distrait. The others accuse her of rambling and for once an actor gives exactly that impression by running once sentence into the next. After her after-breakfast lie down, she is more disinhibited about keeping her negative thoughts to herself. By the time she has returned from her trip to the pharmacist, she is dry-mouthed and stumbles in her speech. Finally, a director has noticed Cathleen’s line that Mary acts as if she’s “a drop taken”. At each of her appearances after a “rest”, Carey shows increased physical lassitude in Mary’s face and gestures. In the early scenes Carey has Mary laugh to herself at various moments as if what she says or others say is a kind of private joke. Later the laughter diminishes to smiles. By the end, she looks both grim and forlorn, not even aware that she is holding the wedding dress she carried downstairs with her. Under Phillips’ careful direction, Carey frighteningly presages this final scene earlier in the play. When Mary is telling Edmund about the first time she met Tyrone, Carey is cheery but, contrary to previous productions I’ve seen, when she is about to describe the actual meeting, she takes a long pause and a cloud passes over her face in a complex expression of fear or pain as if she knows that that was to be the end of her happiness. Carey gives the impression not that Mary is weak, but that she politely listens to what the men say to her while privately disregarding everything. She masterfully shows an inward struggle in Mary between what she thinks she ought to feel as a mother and wife and pull she feels to seek solitude and leave them all behind. As Tyrone, Peter Michael Goetz looks rather like Mark Twain and from the start seems like an old charlatan who is suspicious of being found out. For the first half of the play he delivers his lines in a curiously desultory manner and you wish he’d invest them with more nuance. In the second half, unlike many productions, Goetz shows that Tyrone, who boasts of holding his liquor, is already drunk and slurring his speech before Edmund gets home. He rises to the occasion of Tyrone’s great admission to Edmund of having ruined his own career as an actor and breaks down in tears contemplating his squandered talent. Phillips shows that Tyrone’s question about where the piece of paper is with Edwin Booth’s compliment on it is exactly parallel to Mary’s earlier question about where her wedding dress is. Nathan Darrow is excellent as Edmund. We see that the gloom he feels at the beginning has many sources--fear about his mother, fear about his health and anger that he is no longer free to leave his family as he did before. He gives Edmund’s speech about losing himself in the fog a disturbing quality that parallels Mary’s earlier speeches about the fog. When he says he is “a little in love with death”, he chillingly smiles in same way that Mary had done. As Edmund’s older brother Jamie, Andy Bean is unfortunately the weakest link in the cast. He seems to have dropped in from another play. His accent, sharp line delivery and cocky body language rather suit a successful man in present-day New York City more than man living off his father in small town Connecticut in 1912. In his big confession to Edmund at the end about how he has always tried to make his younger brother fail, Evan Buliung for Soulpepper and Peter Donaldson for Stratford brought out much more anguish and self-hatred in Jamie than Bean does. One fine stroke of casting is to have the maid Cathleen played by an older actor rather, as is too often the case, by someone near to Edmund in age. Helen Hedman does a wonderful job and helps make Cathleen the Tyrones’ one link to reality. The sensible Hedman makes it far more believable that Mary would choose her as a confidante than the silly young Cathleen usually is. For once Cathleen’s complaint that Bridget the cook tells “lies about her relatives” takes on meaning since as a comic counterpart to the Tyrones lies about themselves. In Hisham Ali’s set only the furniture, the staircase and the two bookcases framing the doorway to the hall are solid. Otherwise, the set is made up of frames of fine-gauge screens for both walls and doors. This suggests the summer cottage O’Neill describes but also the unreal world of the Tyrones where walls and doors can be seen through or not depending on the angle of light. The house may be made of screens but no one can hide behind them. Ali follows O’Neill’s directions that Tyrone has jerry-rigged a wire for a table lamp from a socket in an overhead chandelier--a constant visual reminder of his miserliness. Susan Benson’s clean-lined costumes not only reflect the period but also the characters unlike the all-purpose summer linens one sees in some productions, including the current one at Soulpepper. Edmund’s deck shoes and loose fisherman’s sweater link him to his love of the sea. Jamie’s flashy striped jacket matches his vulgarity as does Tyrone’s sweat-stained jacket his stinginess. Benson has created a beautiful mauve gown for Mary with a short train that ripples behind her when she walks and swirls perfectly in front of her when she sits. This lovely effect has its sinister side. It reflects the deliquescence of Mary as wife and mother and recalls the signal event everyone wants to forget when Mary in the throes of withdrawal tried to drown herself. The play’s title alone is a gift to a meticulous lighting designer and the production has that designer in Michael Whitfield. In how many plays of any kind are you able to tell the directional orientation of the set because sunrise and sunset have been so carefully realized? Whitfield is a master of the fade-out so that both acts close with a glow that lingers on Mary’s face just a little longer while all around her rapidly plunges into darkness. In a brilliant stroke Whitfield lights Ali’s set so that it seems that the much-mentioned fog, so loved by Mary and Edmund, not only surrounds the cottage but, by the end, actually invades it. Beside all this, Phillips has had sound designer James Sugg add a reverb to various passages of the play, usually those involving a longing for the past. It is so subtly done that some may not notice it, yet it helps create an aura of unreality about the past that Tyrone and Mary have idealized as the one time when their lives were at their height. While the cast is uneven, Phillips’ penetrating interpretation, the insightful design and the amazing central performance of Helen Carey make this production one that will make you view this classic play in an entirely new way and see it as even richer, more complex and more disturbing than ever. “Better hope deferred than none. Up to a point. Till the heart starts to sicken,” thinks the isolated, totally paralyzed speaker in the dark in Beckett’s Company (1980). This is the terrible point the Tyrone family reaches, finally bereft of illusions, in Phillips’ powerful production. Photo: (top) Nathan Darrow, Peter Michael Goetz, Helen Carey and Andy Bean. (middle) Helen Carey as Mary Tyrone. ©2012 Scott Suchman.